If I hear one more person say (or see one more person comment on a blog) that a garbage bowl is a stupid idea, I might lose it. 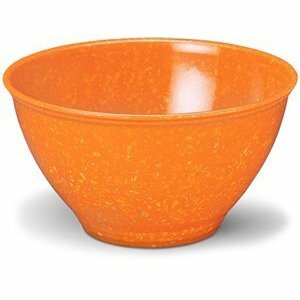 For those of you that haven't run across the garbage bowl idea, Rachael Ray has been using one pretty much forever. She puts a big bowl on her counter to drop garbage into so that she doesn't have to keep running back and forth between the trash can. This is one of her tried and true time saving devices (washing your produce, with the exception of berries, when you get home from the store is another one). So of course, Rachael Ray has a "Rachael Ray" brand garbage bowl, right? Wouldn't you? The big complaint I see is: "Why on earth wouldn't you just put a bowl on the counter? Why do you need a $20 one?" My first thought is to ask if that person carries their wallet around in a ziploc bag. Oh, you have a nice purse? But you could just carry it around in a free bag from the grocery store! You know what, a garbage bowl like the ones Rach uses are fun and cute. They are can coordinate with your kitchen and now they even make them with a non skid base. If you don't want one, luckily you aren't forced to buy one! I love the idea of the garbage bowl as well, it just makes so much sense to me. Alas though I cannot get a special RR one as they don't sell them here but at least I can use something else. I just use a bowl I have right now, but I would love one of Rach's! There are some people in the world that will resent anyone else who is successful, and I think that is exactly what is going on with the complainers. Seriously what is the big fuss about. If you don't like her, don't watch her, and why waste your good time complaining about a product she has. I agree with Ali...why waste your time watching something or someone you don't like. Some idiots complain about being BORED with Rachael and othe FN stars but spending your life trashing them is no way to live. As a matter of fact all that negativity leads to illness and death. You don't want your obituary to read "She was snarky about a TV show" I find most hate sights are full of bullies and cowards who claim they're just being funny. They're not. They're pathetic non-entities whos bring nothing positive to the world. With money being tight nowadays spending it on what in essence is just a bowl is insane. If I want a garbage bowl I will just get one of my mixing bowls and use that. Or better yet, just pull the trash can over to where you are working or use one of those plastic grocery bags to put your trash in. Use the money on something more important like a bill or treating your children to something. And before anyone here says I am a hater, I'm not. I have watched her show occasionally and have picked up some ideas. I just don't agree with blindly buying something just because a celebrity uses it. I was looking for new knives and noticed on her 30mm show that she used a Santoku knife. I bought one and it has lasted years. Don't label everyone jealous or a hater just because they question some of her merchandise. Some of us don't have money to waste. Oh Anony, don't take the post so seriously! It just bugs me when people say it is a stupid thing to buy bc it's just not. People decorate their kitchen with accessories and this is just one of those. I could buy and ugly one or I could buy a super cute RR one that matches my decor. Someone with tight money shouldn't be buying any accessories, must less this one, of course! hate on people with different taste? Thank you, Anony, you made my point exactly. Why do people keep hating about something so silly as a garbage bowl? I don't get it. I am sick of people saying it's a stupid thing to buy. I don't think it is stupid/redundant. I think it is cute and fun. I just got an email today touting the garbage bowl, and I have to say I think it's a stupid idea. We remodeled our kitchen two summers ago (the house was built in 1848) and we set up a sliding trash basket next to the sink and the kitchen island right behind. I have a 5 gallon bucket (cost $4 at the dollar store) next to the trash basket. If I have "garbage" that I can use in the compost, it goes into the plastic bucket, otherwise it goes into the trash. I can't see spending $20 for a bowl to put garbage in. I'm male, so maybe I just don't get it, why women think just because they see it on tv, that you have to do it that way. I hate to repeat myself, LB, but if you don't want one, luckily you aren't forced to buy one! Nor are you required to spend your time writing not one, but two, comments on a blog about them.